I did it! I did it! I did it! I watched the tutorials, read the directions and...I figured out how to put a fan freebie on my facebook page. Generally I get a "Needs Improvement" for following directions, so I am feeling quite proud of myself. 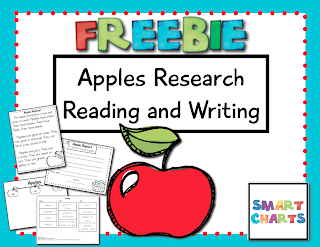 I wanted my freebie to be worth the effort, so I created an A+ apple reading and research writing pack. It has an easy reading page in can-have-are format. Also included are apple tree maps, trace-cut-paste facts, and writing frames. I hope you'll visit my facebook page, click LIKE and pick your apple-licious freebie today! Click here.